Local teddy bear appraiser and expert Ken Yenke received the Theodore Society Ambassador Award sponsored by Jones Publishing, Inc. 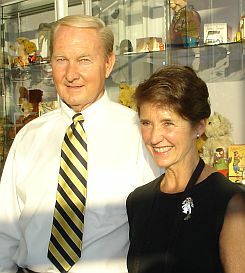 The award was presented at the Doll & Teddy Bear EXPO in Washington, D.C. on August 8, 2008. 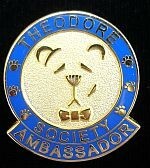 "Ken Yenke's expertise and consistent promotion of the teddy bear made him an obvious choice for the Theodore Society Ambassador Award. We're thrilled to have him join the ranks of the other bear-industry luminaries who have garnered the award over the past five years," says Teddy Bear Review publisher Sarah Gloystein Peterson. Ken is the author of three books, and also writes the "Teddies Reviewed" column in Teddy Bear Review magazine, where people send in pictures of their bears for him to identify and appraise. He gives teddy bear seminars, appraises vintage bears at several leading teddy bear shows and is the curator of the new Toy Museum at the Chelsea Teddy Bear Company in Chelsea, Michigan.